The Parkanson PK360HFA is a fully Automatic Hitch Feed Bandsaw with a capacity of 360 x 360mm. The single stroke hitching length is 500mm on the standard machine which can hitch up to 9 times. 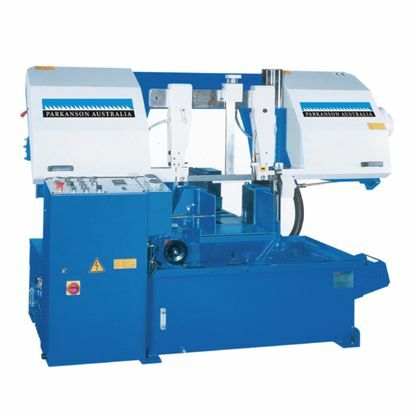 All automatic Parkanson Bandsaws have a full stroke hydraulic vice, even the fixed vice jaw on the carriage opens by about 3mm to allow for any bent or uneven material to be fed without the worry of it jamming . The PK360HFA has a 34mm Blade which allows you to cut solid material to its full capacity. The machines can be supplied with the Parkanson NC Touch Screen which allows you to program different lengths out of the material to be cut. There are 99 programs with 10 lines so jobs can be saved in programs for future use. All the Parkanson Bandsaws can also be supplied with the optional Full Height Vice Jaws and Hydraulic Top Clamp for Pack Cutting. Most parts and accessories for all of the range of Parkanson Bandsaws are kept in stock here in Perth.